The threat level is High and the name of the threat is SONAR.SuspPE!gen8. However, the problem is that the file mentioned is svchost.exe, a Windows system file without which I don’t think my computer will work very well. I can still see svchost.exe in C:\Windows\System32 so at least that file hasn’t been put in quarantine. Can anyone tell me what ramifications the above message actually has? Has NS just blocked the activity caused by the SuspPE!gen8 threat, or has it blocked svchost.exe altogether? For now I'm almost afraid to shut off my computer, not knowing if it will boot up again. Re: Has Norton Security blocked my svchost.exe? To answer my own question in case someone else will have the same issue: When contacting Norton support, I was assured that the blocking doesn’t refer to the svchost.exe as such, but only to the specific process that was found executing the suspicious activity. I think the notification message could have been a bit more clear on this point though. i got this too yesterday while manually updating chrome browser. chrome still managed to update. I have also seen this as of yesterday (4 jan). I cannot see the cause... but speculate it’s about the recent win10 update? It’s seems to happen on boot up. I agree that the message implies svchost.exe is infected. I’m glad it’s not. Today, January 5th I got the same message. Only a few minutes before I had started Norton Security LiveUpdate and ran a Quick Scan. The scan didn't find any problem. Then I checked my E-Mails and only opened one pdf-attachment after checking the mail with Norton. After the Norton alert I ran Norton Security LiveUpdate and did a Quick Scan again. And again the scan didn't find any problem. I hope anybody will find a root cause for this alert. I've seen this too. One occurrence at 22:52 (UK time) yesterday - Jan 4th. I checked with Task Manager:Processes and that showed several other instances of svchost.exe still running satisfactorily. Re the comment by Spleenie, I don't think it's due to a Win10 update as I'm still on Win7 Pro 64 bit. (Unless it's a similar issue in a Win7 update.) I'm using NIS 22.11.2.7. I agree with the comments by others - it would be much more helpful if the Sonar report identified the actual process that svchost.exe was hosting at the time. As it stands, it is a nonsense to report a file that has been stable for over 8 years, is in use by millions of other Norton users, but is still considered "High Risk". I had the same problem on January 4, 2018 (SONAR.SuspPE!gen8 pop-up alert). I had just installed TurboTax and was in the process of changing some of TurboTax's preferences. Since there is no common activity reported by those who have recently encountered this alert (and posted in this thread), then perhaps the heuristics used by SONAR for the SuspPE!gen8 threat are a bit too broad/sensitive (resulting in a FALSE POSITIVE). I'm running Norton Security 22.11.2.7 on Windows 7. Ran a full scan after this happened, no threats found. Is there anyone following this thread who can contact Norton about this issue? Thanks for reporting in Norton Community Forums. We are aware about this issue and our team looking into it. We will update once we have more information on it. Also, please let us know if you encounter this message again. We would like to gather logs for further investigation. As requested by Sunil_GA, here is an upload of my current NIS log files containing the above SONAR entry from 22:52 GMT on January 4th. I don't have a saved image of the error report screen. I have not seen a further occurrence of the problem. I am using Norton Internet Security version 22.11.2.7, running under Windows 7 Pro SP1 64-bit. Error Occurred after updating Windows 10 Pro to 1709, one of the many KB's updated after. Around the error time, there was also an error updating OneDrive, in which a popup occurred and clicking OK to update OneDrive produced IE opening to http://livedog. May or may not be related. SONAR Protection monitors for suspicious program activity on your computer. Millions of users in the Symantec Community have used this file. This file was released 3 months ago. This file risk is high. Millions of users in the Norton Community have used this file. I just encountered this detection. Users searching for information on this issue might be more likely to find this thread if it had a different title. This file was released 7 years 7 months ago. I have been getting these messages regularly since running Windows Update today (1/5/18). Clearly Norton is detecting a valid Windows process as a "virus". I will be disabling SONAR until this can be resolved, and I recommend others do the same. BTW, I am running Windows 7, not 10, so it is happening to both systems since the most recent round of updates. This file was released 8 years 5 months ago. Windows 7 Home 64bit - fully updated including 2018-01 Security Quality Rollup for Windows 7 x64-based Systems(KB4056894) which was installed about 24hrs ago. Computer has been up and running for hours with Chrome and Firefox browsers open and no new websites that I don't go to every day. Did just install a program used by many people created by the people at Binance for their cryptocurrency exchange. It's been running for 2 days now with no problems and was scanned and deemed safe by Norton when downloaded. Nothing found during the Norton daily scan that occurred several hours ago. Just out of the blue the window pops open saying Sonar Detected Suspicious Activity from svchost.exe and blocked it. SONAR-skyddet söker efter misstänkt programaktivitet i datorn. Miljoner användare i Norton Community har använt den här filen. Filen släpptes 3 mån. sedan. Den här filrisken är hög. Me too. No instances of svchost are running so it has been blocked. Why after 4 years has this file suddenly become a problem? The last modification date for the file is July 14, 2009; that's a further 4 years earlier than (before) I installed the OS. 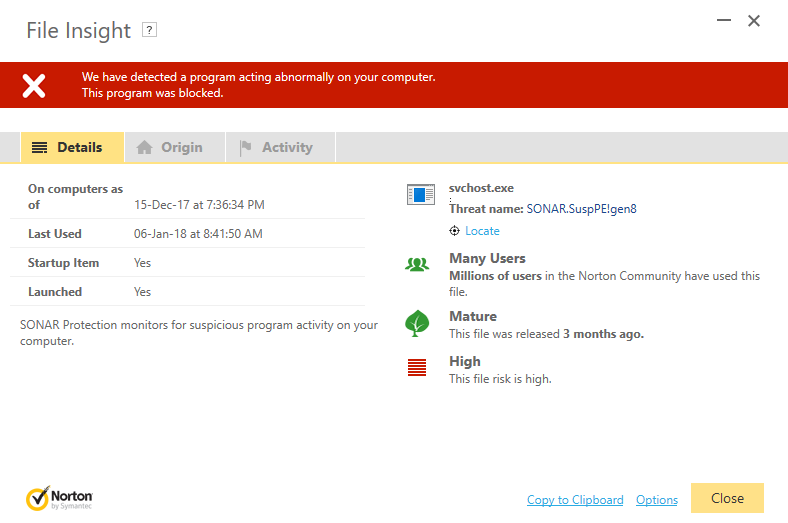 I encountered this Norton Security warning regarding SONAR.SuspPE!gen8 and its blocking of svchost.exe as a result. However, it occurred immediately after my computer had restarted from my having installed the 1/5/2018 Windows 7 Update (KB4056894) today on 1/6/2018 - a day late. Prior to that, there were no problems. No warnings. Today when I turned on my pc after few minutes I got msg about SONAR blocking svchost. Threat name is SONAR.SuspPE!gen8. I got the same problem but just excluded the file in Options and moved on.. it's a false positive..
Norton has blocked my svchost.exe from the location Windows > System 32? What am i to do, is this exe file required for my windows 8? Should i ignore Norton warning and 'allow this behaviour in the future'....? Thanks Norton, but are we to manually override this warning coming from system 32 folder and allow in the future? You haven't said so yet. A point of detail to add to my previous posts and log file submissions - I have not yet applied the January Windows 7 updates (KB4056894) so, like Greendio, I don't think the problem relates to that and it's not a possible solution as flagged on the post by Hopscotch. My last update to Windows was the December Monthly Rollup (KB4054518). Same issue. What action should be taken at the Options -> 'Security Risk Detected' window? If I don't select either option and just close the window, what will the future behavior be? So far I have only seen this block once. If it is something malicious, I'm glad Norton is blocking it. If it is a false positive, Norton should deal with it. But for now, I see no adverse affects from whatever has been blocked. As svchost.exe is used by many different processes, it is best to leave it alone. If you check Windows Task Manager, you may find multiple instances of svchost.exe. The one process that is being detected has been blocked by Norton. Until Norton can check logs to see exactly what is happening, I am just going to let things be. If you block svchost completely, you risk affecting all the other good processes and causing strange behavior of your system. Hello! My name is Dan. Got SONAR.SuspPE!gen8 in a svchost file in Win 10 System 32. It happened after downloading Google Chrome. If this information can be of any help it´s good. As I understand the comment from Norton, it´s not necessary to cut out this file. It will still work while the bad stuff in it is blocked by Norton Security. Hope I´m right. When this happened I haven´t downloaded Nortons protectionfiles for Google Chrome. The need for Google Chrome came because I bought Chromecast to stream files to my TV. Thank You. I have been hit by this as well. I got the alert while playing Forge of Empires online using Chrome. This happened to me two days ago on my windows 7 64 os, at the time I was doing nothing but running norton liveupdate. and it came up and gave me Sonar alart, I ran a full system scan, then superantispyware, and malwarebyles. Found nothing. checked out information on SONAR.SuspPE!gen8 on the web, it seems to be a plugin that gets installed in browsers I checked all three of them I am running found no clue of them on my system. only thing I did notice today is windows update service was not working anymore and needed to be restarted by turn the service off and then on. but even that now works back to normal. Not sure what Symantec did but I am starting to point my finger in there direction after this event. this is that time of year this kind of thing happens when people are away on holidays and code gets screwed up. food for thought. If you did actually have an infection, Norton has dealt with it and you do not need to do anything to remove it or run scans with another piece of software. If you look at your Norton History in Resolved Security Risks you will see no action required. And this still may be a false positive. I didn't say it wasn't a false positive, but was clearly showing that if it was a real threat, like you pointed out there would be a lot more happening in the background. like norton not working. Same here.... I was running avast pro for a couple of years and had no issues... From the moment I downloaded the 3 device $68.99 program my computer has slowed out of site and I also got this Sonar thingo a couple of days ago... iphone and ipad seems to be working ok but my lappy needs rebooting every hour due to very slow data entry and times that it seems Norton needs to catch up , sometimes a few minutes?... I am a very basic user, facebook, Emails , small search stuff , use about 25 gb a month, I am wondering if I have gone the right way with the Norton purchase? I have the same notation about the googleupdate.exe in my Norton History.